Photo by Renée Hoffinger, Gainesville Interfaith Alliance for Immigrant Justice member. If we hope to change corporate policies to benefit rather than exploit the 99 percent, we should study the Coalition of Immokalee Workers’ history and organizing model: Consciousness + Commitment = Change. They have discovered how to challenge giant corporations in the 21st century – and win! Together with consumers, they are forging a hopeful reality, one where we are bound together not only through our objectification and exploitation but also through our liberation. In 1993, six Florida farm workers decided Ya Basta – “enough is enough.” Enough poverty wages. Enough sexual abuse from bosses. Enough violence in the fields. Enough water and shade deprivation. Enough arriving at 5:00 am only to sit waiting for five unpaid hours. Enough human trafficking. Enough $3,200 per month, Manhattan-priced housing for lousy trailers. Enough exploitation. So they began meeting weekly in a room borrowed from a local church to discuss how they could better their communities and lives, despite working in the agricultural industry – one of only two industries excluded from the 1930s labor protection laws in the U.S. If zero labor protection isn’t insult enough, farm workers are also paid “by the piece” rather than by the hour, and despite inflation, the average “piece-rate” wage tomato harvesters receive – 50 cents per 32-pound bucket – has not increased since the 1980s. By today’s standards, this means a farm worker must harvest 2.5 tons of tomatoes in one day just to make minimum wage. This is the system they were seeking to transform. Fast forward 18 years to 2011. The Coalition of Immokalee Workers (CIW) is more than 4,000 members strong and has convinced nine multi-billion dollar food corporations to sign its Fair Food Code of Conduct, requiring they not only pay a penny more per pound of tomatoes – 32 extra cents per 32-pound bucket – but also stop purchasing from growers who tolerate exploitation. Photo courtesy of Gainesville Interfaith Alliance for Immigrant Justice. Thus, for the first time this November, more than 30,000 Florida tomato harvesters will receive a 64 percent wage increase, a clock-in system, an at least minimum wage guarantee, a confidential complaint resolution system, and on-the-clock worker-to-worker labor rights education. But for tomato harvesters working in fields contracted to non-participating corporations, they still receive only 50 cents a bucket and are guaranteed no rights. So while the CIW has achieved ground-breaking progress towards uprooting the systemic causes of exploitation, their struggle for complete transformation continues. When those six workers came together in 1993, they knew what they opposed but not exactly how to achieve what they wanted. At first, they sought negotiations with their immediate bosses – crew leaders and local growers – but soon recognized how corporate food industries leverage their buying power to demand the lowest possible prices from already struggling farmers, thereby pressuring farmers to keep workers’ wages low. So rather than simply calling for a wage increase, the CIW developed a very specific goal: the Fair Food Code of Conduct, a legal contract that they can pressure companies to sign, requiring they pay a penny more per pound of tomatoes and cease purchasing from growers who tolerate exploitation. Next, they chose the first company to pressure. In 2001, they called for a boycott of the largest restaurant company on the planet, Yum! Brands, Inc., parent company of KFC, A&W, Taco Bell, Pizza Hut and Long John Silvers. Students were among the first to protest corporate dehumanization of both suppliers and customers. As communicated by the grower who once said to an indignant CIW harvester, “A tractor doesn’t tell the farmer how to run the farm,” each person is expected to play a predictable role in the corporate business plan. But we defy and undermine the corporate business plan when we refuse to be obedient, predictable consumers. Just as the CIW yelled back, “I am not a tractor,” students also showed, through Boot the Bell campus boycotts, that they were not mindless mouths. What’s next and where do you fit in? Despite that progress, supermarket stubbornness still stands in the way of a sustainable solution. So far, only one supermarket, Whole Foods, has signed the Fair Food Code of Conduct. Despite this lack of support from their largest buyers, the Florida Tomato Growers’ Exchange (FTGE) took a step of faith and signed with the CIW, so this November concrete changes are being enforced in FTGE tomato fields. FTGE represents 90 percent of Florida farmers, but they worry if everyone isn’t on board, the agreement may be undermined, especially if supermarkets purchase tomatoes from non-participating growers. Why would Publix support fair trade coffee from another continent but not fair tomatoes from their home state? Here in Gainesville, the Interfaith Alliance for Immigrant Justice (IAIJ) is asking the same question, and we’re partnering with the CIW to pressure Publix’s CEO, Ed Crenshaw, for an answer. This past July, the IAIJ held a press conference at Gainesville City Hall, announcing a letter signed by 24 local clergy, urging Publix to meet with the CIW. After the announcement, Interfaith Action, a CIW sister organization, invited me to intern in Immokalee during August and September. My task was to help organize a 200-mile “Pilgrimage to Publix” by bicycle from Immokalee (home of the CIW) to Lakeland (home of Publix). Our goals were to create a compelling narrative for the media, to raise further awareness and partnerships with congregations along the way, and to invite CEO Ed Crenshaw to visit Immokalee and learn why Publix’s participation is so critical. As he has for the last three years, Mr. Crenshaw ignored the CIW’s latest effort to reach him, so the CIW called for escalation and a Supermarket Week of Action the following month. 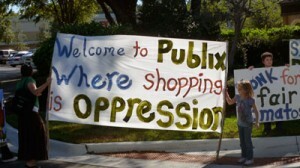 On Oct. 13, Gainesville’s IAIJ picketed outside the grand opening of an Ocala Publix; the same day, Tampa Fair Food picketed a store opening in St. Petersburg. Ten days later, 11 IAIJ clergy delivered their letter while holding a tomato aisle “pray-in” at the Millhopper Publix. Publix called the police, but no clergy were arrested. 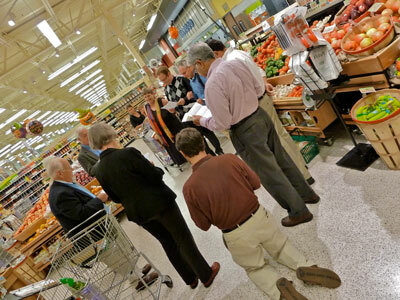 After the pray-in, clergy discussed having congregations “adopt a Publix” and hold regular pray-ins. The CIW and their allies will persist until wealthy supermarket CEOs agree to give tomato harvesters what they deserve. As a community organizer, I strongly believe political education should always go hand-in-hand with action. Please pick up your phone right now and request Publix CEO Ed Crenshaw sign the CIW’s Fair Food Code of Conduct: 863-688-1188, ext. 52347. To get involved locally or learn more, see the listing for Gainesville IAIJ in the Iguana Directory.